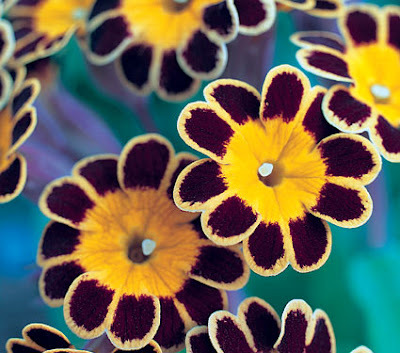 Polyanthus ‘Gold Lace’ is one of those varieties that always attract the eye. 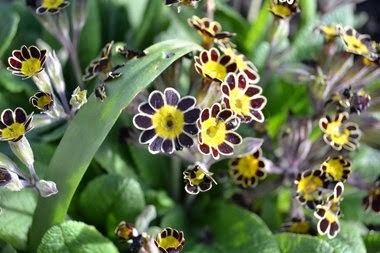 Its ‘auricular’ style of flower - unusual for polyanthus varieties - is both bold and intricate, but don't let its delicately patterned flower fool you because the 'Gold Laced' Polyanthus is as tough as old boots and extremely winter hardy. Dating back to the mid-1600’s, Polyanthus ‘Gold Lace’ is a true historical gem; in fact it was once held in such high regard and considered to be the ‘Florists’ polyanthus. Like primula auricular cultivated varieties they were displayed on stages draped with a black fabric and surrounded by a frame in order to view them without distraction. This was during a time (18th and 19th centuries) when the word ‘florist’ was used to described enthusiasts of a limited range of flowers who, having grown their speciality flower to perfection, showed it in keen competition against those grown by their fellow florists. A passion which is still followed by breeders in the United States today. It has unfortunately fallen in and out of favour over the centuries since it made its first appearance and, for a time, was at risk of disappearing completely. Today its unusual flowers are back in favour, a breath of fresh air when compared to the blousy hybrids that are more commonly sold. They can be grown from seed sown during the first half of the year – any time between January and June, but don't expect to see any flowers until the following year. They are just as easy to grow from seed as any of the common garden primroses and polyanthus, its only requirements is that they are raised in a damp, well-drained soil in a sunny to semi-shaded position. That being said they are not quite as hardy, and like auricular are best overwintered in a frost-free position. Generally if they are left to over-winter outside, especially in colder, northern climates they will either succumb to the poor environmental condition or become damaged to a point they are unable to produce a decent specimen the following year. The best practice is to over-winter them in an unheated greenhouse, keeping the compost just on the moist side. Once new growth appears in the spring, watering can slowly increase as daytime temperatures rise. Apply a liquid soluble fertilizer once a month for plants in the ground and every two weeks for pot grown specimens. Polyanthus ‘Gold Lace’ it is attractive to both bees and butterflies and therefore more is also environmentally friendly than the modern, and arguably more popular, double-flowered cultivars.